Maitripa was one of the great mahasiddhas of India, and an outstanding figure both in Mahayana and Vajrayana Buddhism. It is said that he had been a student of Naropa, when the latter was head of Nalanda monastic university. Later he had spent time at Vikramasila, where the great Atisha was its head of discipline. Although Maitripa was already a renowned scholar and yogi, Atisha was obliged to expel him when his yogic activities (involving alcohol and a woman) caused gossip. It was only after Maitripa demonstrated his realisation by crossing the Ganges on a leather cushion, that the monastic community realised their loss. 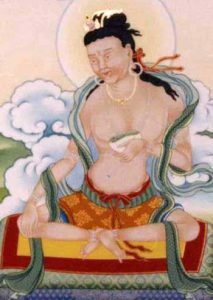 He then took Savaripa as his guru, who guided him to a complete realisation of Mahamudra, after which he lived the life of a mahasiddha and master. It is through Maitripa that Maitreya and Asanga’s famous treatises Distinguishing Dharma and Dharmata and The Sublime Continuum came to be so widely influential in Tibet. As well as these crucial texts on understanding the mind and buddhanature, he also transmitted the actual practice and realisation of Mahamudra to his main disciples. Of these, of prime importance were Marpa Lotsawa, founder of the Kagyu lineage in Tibet, and Khyungpo Naljor, the founder of the Shangpa lineage.